We all want to be more versatile golfers. And the more mastery you have over your wedge game, the better equipped you are to handle a variety of circumstances on the golf course. From pitching to chipping to greenside bunkers, skillful wedge play can keep both your scores and your cursing at a minimum. If you struggle with wedges, you probably don’t need me to tell you that distance control is essential to good wedge play. We’ve all been there—overshooting the green or watching the ball ricochet back into the bunker. I’m going to share 3 keys to improving your wedge game so you can put an end to this frustration. When you master these tips, you will be able to approach some of your most daunting lies with confidence. But first, let’s go over some practice strategies to ensure that you get the most of out of the time you spend practicing these techniques. It is important to strategize your golf practice. It’s not enough to go to the driving range and swing your wedges until your shoulders are sore. You need to set a deliberate method and practice with intention. Here are three ways to make your practice time truly game-changing. You are most likely practicing your wedge game on the driving range, in your backyard, or against a net in your garage. You’re in a scenario that’s very different from a typical round of golf. However, one way you can—and should—replicate your regular golf experience is by using the same ball you’d use out on the course. This may seem like an inconsequential detail, but every golf ball reacts a little differently. When you practice with your regular ball, you won’t have any surprises when you put your new skills to work on the golf course. As I mentioned before, the key to excellent wedge play is excellent distance control. The goal of your wedge practice is to improve your ability to send your ball exactly where you want it. Traditionally, amateur golfers have had to take their best guess when it came to evaluating carry distance. 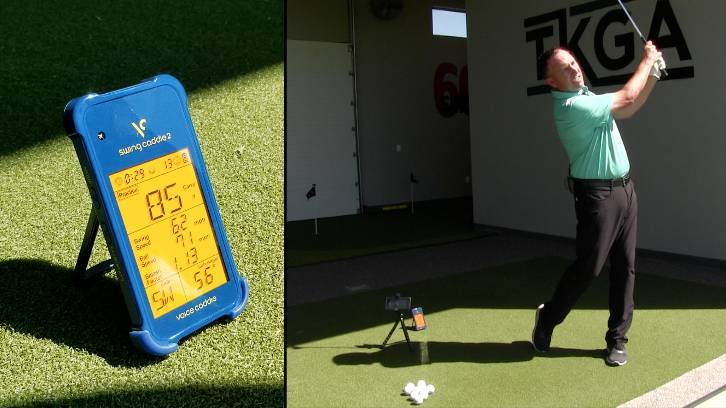 Now, golf technology has advanced to the point where even weekend golfers have access to portable launch monitors. My preferred portable launch monitor is the Swing Caddie SC200. 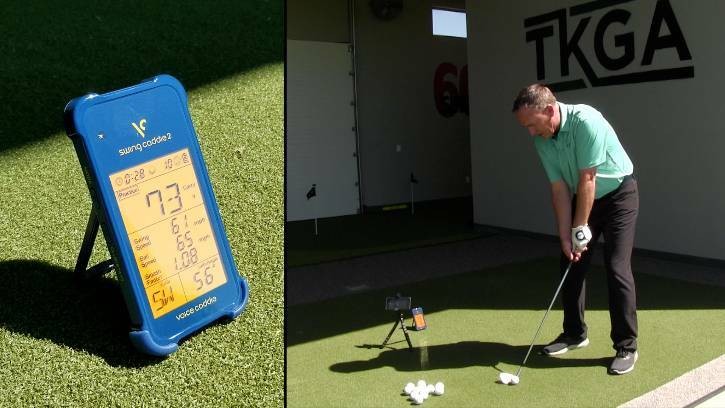 It’s inexpensive and provides readings on swing speed, smash factor, ball speed, and carry distance with accuracy comparable to the $15,000 launch monitor we use at the Todd Kolb Golf Academy. But no your preference, the goal is to find some device that provides exact feedback on every swing. You can do a lot more with a specific number than with a vague estimation that your last shot traveled somewhere between 65 and 75 yards. In any golf practice, it is always important to have a specific goal. This is especially true for your wedge game, when you’re focused on distance control. I recommend selecting three goal distances, ideally something like 50 yards, 75 yards, and 100 yards. Take the time to work on mastering each one. This is where that launch monitor really comes in handy. Now that you have a practice strategy, let’s talk about what exactly you’ll be practicing. When it comes to wedges, distance control depends on three major factors. 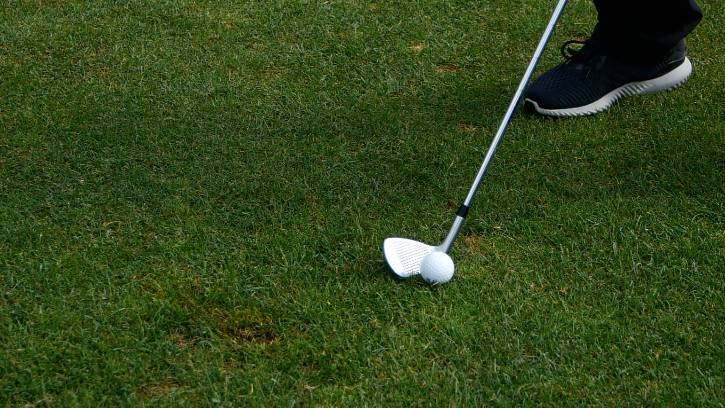 You can master all three factors by observing these keys to a skillful wedge game. Control the length of your swing. To illustrate my point, I took a couple practice shots with my trusty, old Titleist Vokey 58-degree wedge. I set a goal distance of 75 yards. Now, I know that in order to hit a 75-yard shot with this wedge, I need my lead arm to be parallel to the ground at the top of the backswing, and I need to finish with my trail arm parallel to the ground. That is the proper swing length for a 75-yard shot. I took two shots at this swing length. Sure enough, my Swing Caddie reading was 76 yards on the first shot and 72 yards on the second. If I were practicing a 50-yard carry distance, I’d shorten that swing length. For 100 yards, I’d lengthen it. Easy enough, right? The next tip is a little more challenging. The higher your swing speed, the farther you hit the golf ball. As a test, I took a shot using the exact same swing length I used to hit my 75-yard target. This time, however, I picked up my rotation a little. As a result, my Swing Caddie showed a carry distance of 85 yards. That increase in swing speed added 10 yards to my shot distance. Now, I personally think swing speed is the most challenging skill to master when you’re working on your wedge game. It also illustrates why it’s valuable to have a portable launch monitor on hand. A good launch monitor will tell you your swing speed as well as your carry distance, so it’s easier to spot patterns and keep tabs on your improvement. Now, let’s talk about loft. For now, I’ll keep it simple. To control your distance, you have to control your loft. My Titleist Vokey has a loft of 58 degrees. When I take my setup, I can maintain that 58 degrees by keeping my hands even with the golf ball. If I want to decrease my loft—say, 56 degrees or 54 degrees—I can do that by positioning my hand ahead of the ball. You see how the position of your hands can completely change the loft of your clubface. This is why it is essential to maintain your wrist position throughout the swing. I took a couple swings to illustrate my point. To start, I like to bring my hands slightly in front of the ball to decrease my loft just a bit. I took a swing from this position, first taking a minute to notice the angle of my lead wrist at setup and maintaining that angle throughout the swing. See the picture below. The Swing Caddie gave me a carry distance reading of 69 yards. I took another shot, but this time, I deliberately made a very common amateur mistake. I cupped my wrist as I swung through. To put it another way, I hinged my wrist, working the back of my lead hand up towards the sky. In doing this, I significantly increased my loft at the moment of impact. My Swing Caddie displayed a distance of 55 yards: 14 yards less than my previous swing. You can see how you could completely transform your wedge play just by mastering wedge control. We just covered a lot of ground. Now that you have a grasp on the how and why of improving your wedge game, here’s a quick recap to keep it simple. Practice with the same golf ball you use in a typical round of golf. Use a device like the SC200 Swing Caddie that provides feedback on your swing. Practice hitting the ball the same distance each time. A good approach is to spend a little time drilling each of three distances, like 50, 75, and 100 yards. Control your carry distance by controlling the length of your swing. 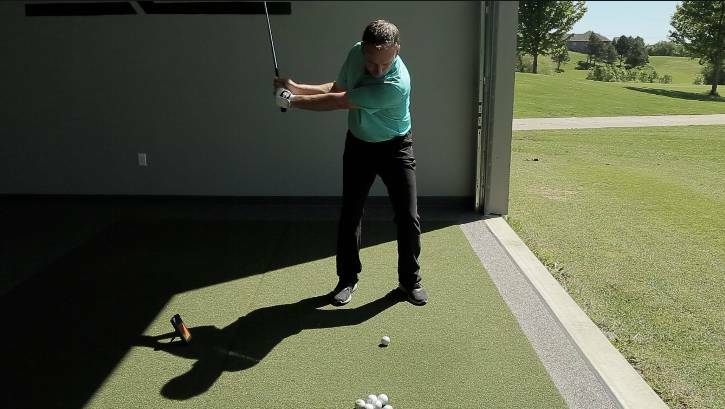 Increase your swing speed to increase your yardage. 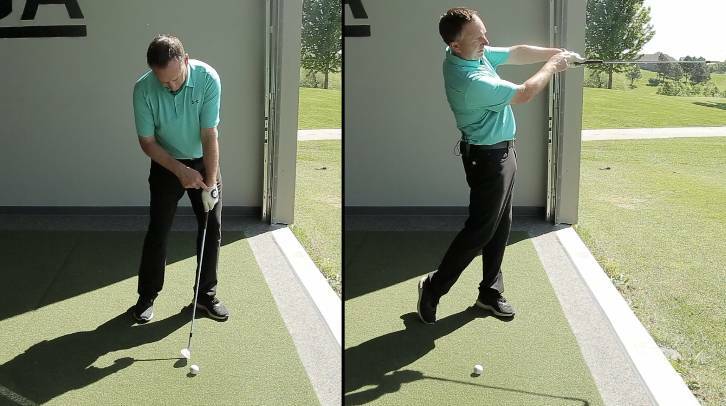 Maintain consistent loft throughout the swing by keeping your lead wrist in the same position from setup to finish. Cupping your wrist increases loft and decreases carry distance. Master these tips, and I guarantee you’ll start to see real changes in your wedge game and on your scorecard. Have you tried these techniques? Do they work? Is there anything here you disagree with? Let us know in the comments! We always enjoy hearing from you—even if you’re chiming in to tell me I don’t know what I’m talking about. We at USGolfTV are all about talking golf, whether we’re answering your questions or joining in the debate. And to stay up to date with USGolfTV, be sure follow us on Facebook, Twitter and Instagram. And for helpful video tips, subscribe to our YouTube channel!